I can't remember exactly how I landed at the feet of Chvrches, whether it was from an email or a random discovery, not that any of that matters now as I'm sure they would have found a way on to my speakers sooner or later, but it's safe to say as soon as I heard The Mother We Share over a year ago to the day I was instantly hooked. Many 'blog' bands have come and gone over this period but none have made such an impact as that of Chvrches. It's all far too easy to label the Scottish trio as simply bubble gum pop but dig a little deeper and you'll come to realise there is a lot more to them than meets the eye. A complex nature that runs through the heart of their music. An almost perfect complexion of Synth-Pop greatness. 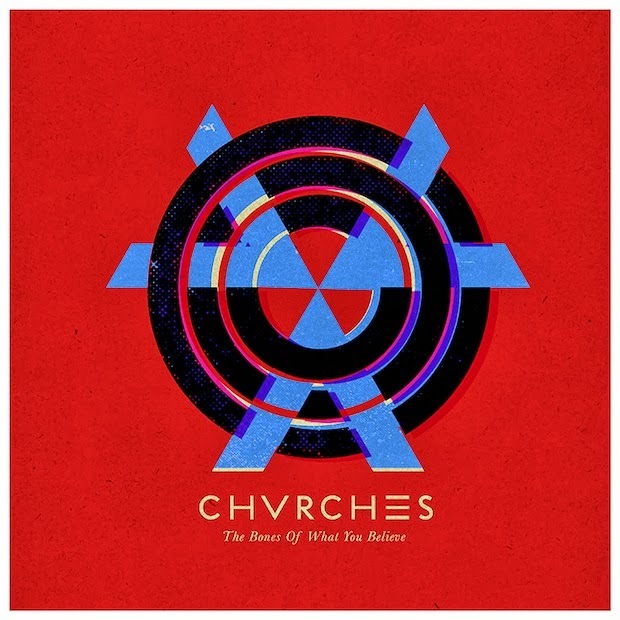 If there ever was a formula for creating such a masterpiece Chvrches have nailed it. Sky-rocketing to success in such a short space of time and with a few EP's under their belts the band hit the road hard throughout 2012/13 although that just left fans even more eager for an album. Seeing them in a sweaty Thekla back in February its release on September 23rd just felt like a lifetime away. Managing to catch the trio again at London's Field Day Festival in May eased the pain slightly (if you get a chance, go see them live, I highly advise grabbing it with both hands) and before I knew it September had finally arrived. Even with a large chunk of the album made up of tracks many of us have had on constant rotation for months (The Mother We Share, Gun, Lies and Recover) they still seem to stand the test of time well sounding as fresh as the day they were first released. The album has been a long time coming but the final result has been more than worth the wait. Evidently demonstrated through the arpeggiated synths that melt in to one another on the urgently driven We Sink. Taking emotive twists in her stride Lauren Mayberry manages to slice through the dramatic delivery of the digitally organised mayhem. Tether does just that. With heavy hearts rooted in its swelling nature it's not long before we're hurtled through an hypnotic trance of pulsating backing vocals and shimmering synths. At the half way point things get switched up even further with Martin Doherty taking the limelight with his vocal talent on Under The Tide flowing effortlessly over fluctuating basslines and rhythms. Night Sky begins to show the trio in a different light. One of more insecurity and contemplation as Lauren begins to swoon "I'm the cold heart. I'm the secret that you hide. I'll be listening until you decide". My favourite vocal delivery thus far comes on Lungs. With its grandiloquent churning of big hitting basslines you would almost think Lauren's delicate voice would be out of its depth but in reality it's far from it. The two fitting together in a seamless blend of perfection. As the album rounds up on You Caught The Light you get a stark realisation that there's still a lot to come from these newbies. This is definitely the most seasoned on the record as wave upon wave of sophisticated synths and minimalistic openness awash over you. Martin Doherty takes vocal duty once more adding his sedative touch to an already compelling composition. As far as debut records go 'The Bones of What You Believe' is a fine effort, one of which the band can be proud of as they bask in its inevitable forthcoming success. I just wouldn't want to be in charge of choosing the singles with each and every one of its twelve tracks worthy contenders. The Bones of What You Believe is available to buy now. The band will head out on a number of UK dates this Autumn. Full details below.